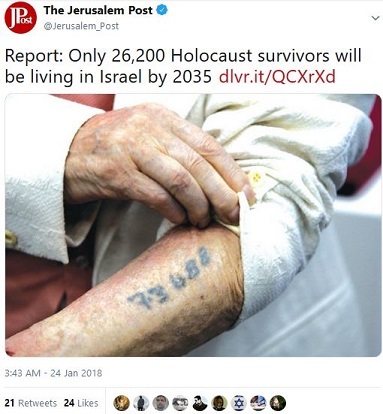 According to a tweet on January 24, 2018 by The Jerusalem Post, “Only 26,200 Holocaust survivors will be living in Israel by 2035”. Auschwitz, the most infamous of Nazi German concentration camps, was liberated on January 27, 1945 by the 322nd Rifle Division of the Soviet Red Army. If we assume that the 26,200 Holocaust survivors who will still be alive and living in Israel by 2035, had been newborn babies when they were liberated in 1945, that would make them at least 73 years old today, and at least 90 years old by 2035. In the United States, the life expectancy for people born in 1945 is 63.6 for men and 67.9 for women. Given the harrowing conditions for Jews in the German concentration camps, one would expect Holocaust survivors to have a shorter life expectancy than Americans born in 1945. All of which makes those 90-year-old or older 26,200 Holocaust survivors who will still be alive and living in Israel by 2035, truly remarkable in their longevity. This entry was posted in Judaism/Jews and tagged Auschwitz, Auschwitz death books, Holocaust survivors, U.S. life expectancy for those born in 1945. Bookmark the permalink. And a remarkable example of human endurance. “Remarkable” indeed. Almost “miraculous”. From my experience it seems like every Jew I meet knows a few. It would be interesting to compare it, percentage wise, to the general surviving WWII population. those that survived probably were stronger than the average person. survival of the fittest. not necessarily the strongest but the fittest. It’s called a RACKET, and the German people have been paying for it ever since the end of WW II. They better hurry and start making more. No holocaust, no Freemason created Zionism & state of Israel. It already is genetic. They claim that the grandchildren of Hollowco$$$t survivors suffer, knowing what horrible things happened to the grandparent(s), relatives, or Jews in general, somewhere, sometime.